efore contact us you can search in our FAQ to find answer to common questions. If this section didn't help you, use contact form to get in touch with our customers support. You will be answered shortly. he following section is about licensing, presale, general requirements, support, updates and more. No, all our products once purchased can be used and installed without any limitations on how many domains you need. Our expertise free support is included for 1 domain, if you need assistance on multiple sites it's required a new license for each domain or an extra hourly charge. Free updates are included for 1 year from the date of purchase. Free updates last 1 year from the date of purchase. This means that you will have access to your products folder for 1 year and you will be able to download the latest release or update the extension through the Joomla! updater. After 1 year you can continue to use downloaded products without any limitations but you won't have access anymore to the products folder on our store to download new releases and you won't be able to update the extension through the Joomla! updater. Your account will continue to be available on our store, so if you choose to get a new version of an extension you simply need to buy it again. Moreover a newsletter reminder including a special coupon code to apply 20% discount will be sent you 1 week before the updates license expiration. Free updates last 1 year from date of purchase. This means that you will have access to your products folder for 1 year and you will be able to download updates for free. After 1 year you can continue to use downloaded products with no limitations, if you want to have access to updates and download new releases you simply need to buy again that extension. This will give you access to updates for one more year. The latest version of an extension, once purchased, is available in the product folder to be downloaded, it's accessible after the login clicking on 'Left menu'->'Purchased products'. You can download and install the latest release of your purchased products to update them for free within 1 year from the date of purchase. Updating an extension is an extremely simple task, you need only to install again the package as usual and all settings won't be lost but only new files will be updated automatically. If your updates license is expired after 1 year and if you choose to get the latest release of an extension, just buy it again to extend the updates license for 1 year more. Moreover our free and commercial extensions are integrated with the Joomla! Updater to download and install updates automatically in just one click. In the case of commercial extensions you need only to specify in the component configuration your email address used to register and purchase the extension on our website in order to validate your license. Finally our extension JSitemap, JChatSocial and JRealtime Analytics include a built in auto updater that works exactly in the same way of the native Joomla! Updater and can be used as an alternative directly from the control panel of the extension. The Joomla! updater will notify you when an update is available, moreover most of our extensions include a version checker to get notified about new releases available to download and install. Some of our major extensions include even an auto updater to download and install updates automatically in just one click. Notice that although the Joomla! updater will notify you about new updates, it won't be able to perform the update automatically being required a valid updates license for commercial extension. Download and install the latest package from your reserved area or use the built-in updater to update the extension to the latest release. Yes, all our extensions are shipped without any limitation regarding domain you want to install. Only our free support is limited to 1 domain to help during initial setup if needed. We are the only ones to develop and distribute our award winning extensions that can be downloaded only on this site. Be careful to not download our products on websites other than this one, our extensions can be downloaded only on this official website. If you find our extensions downloadable on other sites at a cheapest price or for free, be sure that viruses, malwares, security injections and hidden links have been added by other people in our products to infect your PC or Joomla! website, thus download and install those extensions on your site at your own risk! Moreover we do not provide support for our products downloaded elsewhere and without a valid purchase license. Usually all our extensions are available for all Joomla! versions released, from 1.5 to latest. If some Joomla! version is not supported it will be shown in product sheet. No, our ecommerce system tracks products purchased by every single users and let you find products download in your member area file system, accessible from 'Purchased products' on left menu. See 'How get it' section for more details. There are no particular requirements in order to run smoothly our extensions. They work also on shared hosting installations of Joomla! using at least PHP 5.3 and a regular MySQL/MySQLi/MariaDB database. Some more advanced and modern features could require PHP 5.4 as a minimum requirement. Our extensions are already compatible with PHP 7. It's strongly recommended to not using our extensions on Microsoft IIS server or with different database layer such as MSSQL or PostgreSQL to avoid unexpected issues and incompatibilities, our extensions only support MySQL/MySQLi/MariaDB database. Our support team is available 24/7 every day from Monday to Sunday. Your support request is usually answered immediately within minutes, in some cases it may requires few hours to understand better your issue and give you optimal answer and solution. Our policy doesn't offer forum or blog to ask help from other users. We prefer process personally every single request and customer need, for this reason on our store is available a form to send us quickly every type of question. This ensure best service for you offered by top expert and developers, less time to find solution to your problem, and avoid a lot of unnecessary discussions between users that really don't know how our extensions work and how to solve issues. Take care that to request support and to post in the forum for paid products you need a valid license, asking support for paid products without a valid license is not allowed. You can get support by email or forum until you have a valid license for the purchased product and you are one of our valid customers. If needed we include max 1 hour of on site assistance for every single purchased product and the included support is normally limited to 1 domain. This means that if after installation you are in troubles, you can contact us providing admin access or FTP credentials in order to allow our team to setup extensions or solve issues. Of course our support is limited to provide starting setup or solve blocking errors, we can't spend whole days on your site to fine tuning every single aspect about the extension you purchase; in this case extra costs are involved and must be evaluated case by case. Take care that to request support and to post in the forum for paid products you need a valid license, asking support for paid products without a valid license is not allowed. Yes, we offer customizations service but your request should be evaluated and approved. For simple customizations no extra charge will be applied, for more complex one you could be notified about price. If customization requires too time spending activity it may be rejected and planned as an addition to develop in next release of extension. If you requested or made by yourself some customization to extension source code, you should be careful for next updates to avoid overwrite and lose these specific changes. Usually when you request us for customizations, once approved they are integrated in standard next release to avoid overwriting. 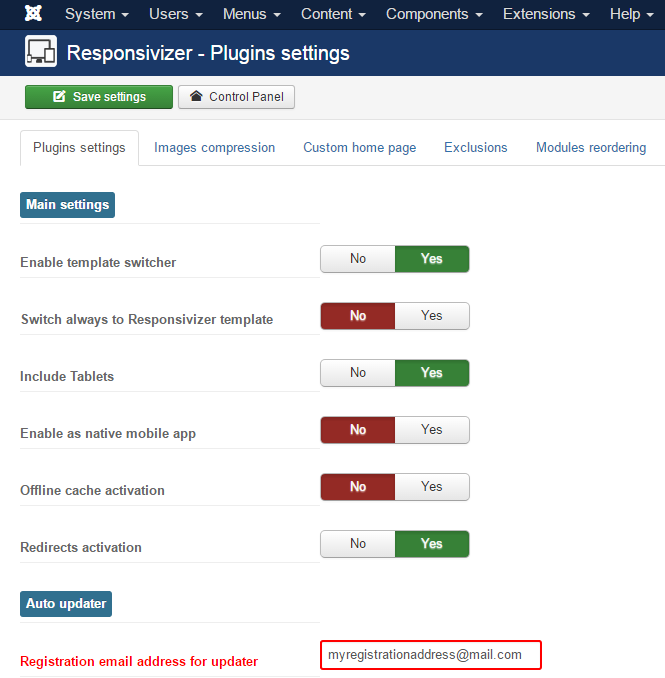 However if you have a customized version of our extension, before upgrade it to latest release both manual install or Joomla! auto updater, you are strongly encouraged to backup it. No, as is stated on our page 'No domains restrictions. No subscriptions. All unlimited.' means that once purchased an extension you can install it on how many domains you want. Also if necessary we assist you on startup with no extra charge. Of course if you need assistance on multiple domains that requires a lot of work by our developers, an extra charge can be applied and can be evaluated case by case contacting us and giving more details about your need. You can ask a refund within 30 days from the date of the purchase. Please avoid to contact us after 30 days asking refunds because orders can't be canceled anymore when this period expired. Yes, this is our store and this is our policy so we reserve the right to change policy, prices and all that is related to our ecommerce. Time left for free updates could be set to 6 months instead of 1 year, prices for products could change based on our marketing trend. We are not required to ask you permissions, so avoid to email us with complaints if you can't download updates because policy has changed, or if you purchased a product last year at a lower price. No, you can't open Paypal dispute/chargeback. We are selling digital goods with no needs to be shipped so opening a Paypal dispute saying that you haven't received what you purchased or that the product is different from description is not suitable at all. You have demo areas to see software working, you can ask us for a free trial, and if you experiment issues on your site after installing extensions our professional support is at your service for FREE to solve any kind of problems. So you are not allowed to open Paypal disputes, simply because there is no reason. This won't help you to be our friend, moreover if after trying to solve possible issues on your site you can't still use purchased extension we will be glad to send you money back without the need to open a Paypal dispute. We are honest people and we ask you to be the same with us, otherwise you will be BANNED from our store.